Owned by the Montalcinese Mantengoli family since 1933, the 50 ha (of which 9 are vineyards) La Serena estate in Montalcino in Tuscany was brought to life in in 1988 by sons Andrea & Marcello, an architect who designed the imposing winery. 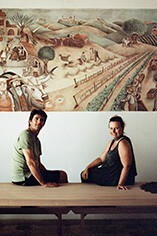 Andrea and his wife Elisabetta, along with their young son Giorgio, now run the estate, aided by consultant Paolo Caciorgna. Situated on an eastern shoulder of the Montalcino zone, below the town itself, the property is fortunate to have vines on limestone rich tufo soils, which Andrea manages organically. Stylistically La Serena’s wine echo those of its neighbours, such as the more celebrated Cerbaiona nextdoor, the tufo soils, good water retention, high altitude & eastern aspect giving plum coloured ruby red wines with generous loganberry fruit flavours. Vinified in stainless steel & then subsequently aged in large slavonian oak botte as well as in a small amount of second fill barriques, Andrea’s wines display a great drinkability even when young while respecting the identity of their piece of Montalcino terroir. Their Rosso di Montalcino comes from younger vines from lower, more humid & fertile parcels giving plenty of thinner skinned grapes & hence earlier drinking wines. 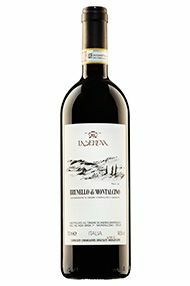 The Brunello di Montalcino fruit is selected from the vines higher up the slope, on poorer, better drained soils giving less but better, thicker skinned bunches. 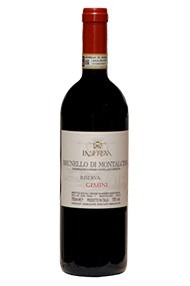 The Brunello di Montalcino Riserva ‘Gemini’ is a selection of the best fruit, from the oldest vines, from clones giving the most loosely packed bunches. All the vines are (increasingly) trained to guyot (capo volta) for more lighter, more loosely packed bunches (vs. cordon speronata that gives more compact, heavier bunches). A hotly-awaited wine, the 2010 is Andrea’s first Riserva since the 2007 vintage. Only 8,000 bottles were made of this profound, deep-garnet beauty from the mythical 2010 vintage. Aged only in large botti, not barriques, the nose is rich with tamarind, kirsch, dark cherry, tobacco and loganberry. It's so finely detailed, yet flows effortlessly, a thread of dark, forest fruit, and white-stone minerality. Local lad Andrea Mantengoli’s organic fruit, modern approach to winemaking and use of both large Slavonian barrels and small French barriques for ageing, provides a more contemporary expression of Brunello di Montalcino. Indeed so much so that we charged him with making our new own-label Brunello di Montalcino. The seven-hectare property is well located close to neighbours Cerbaiona, on the north-eastern shoulder of Montalcino, blessed with atypically white, tufo, limestone soils. First tasted in February 2013, before bottling, this Brunello di Montalcino was notable for its completeness, its complexity of loganberry, black pepper, black truffle; very sapid, crunchy, ‘carnoso’ (meaty), with great balance. Last summer, the wine showed more tamarind and tobacco. And in Jan 2015, from bottle (since August 2014), it seemed an incredible ‘force of nature’, with spicy incense, tar, quinine and liquorice notes. Enjoying a relative short maceration of 12 days, it’s fleshy, generous, ‘sucoso’ (juicy) yet structured too. Much more Nebbiolino than the sunny, grasso 2009. The cream of Andreas Brunello crop, this Riserva has been aged in 100% new French barriques, wrapping the wine in a seductive sheen. At its core though is some undoubtedly fine fruit. Spirity notes are matched by a super silky, super ripe decadence, along with evident elegance. Dark and deep in appearance, the 2012 Brunello di Montalcino bears many of the hallmark characteristics of the vintage. Sangiovese produced smaller berries and thicker color extraction in this vintage. This Brunello does indeed show more muscle and brawn, but it does so with an impeccable sense of balance and persistence. I cannot but admire this achievement. The quality of fruit is succulent and rich, and there are many pretty aromas of dark cherry, pressed blackberry, underbrush, cola and licorice to earn your admiration. Its textural fortitude is equally admirable.